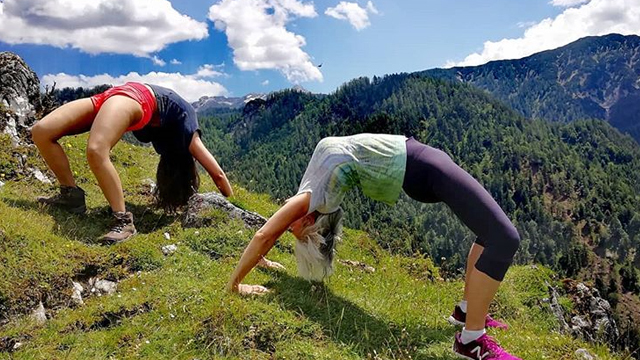 Study after study has pointed to the many beneficial effects of yoga – including stress reduction, mood enhancement, and greater vitality and energy – but did you know that you can enhance many of these effects by enjoying the experience in the Great Outdoors? Studies have shown that people who make time for yoga, enjoyed sustained happiness – much more so than when they take part in other admirable hobbies such as academic pursuits or even fundraising to help the needy. Spirituality, or seeing ourselves as part of something greater, has been found to promote a more positive outlook, freeing us from the stress, anxiety and depression that can ensue when we feel that we have to face all our battles alone. When we engage in spiritual pursuits with others – be it in a yoga class or other settings, we also enjoy a sense of community, which is enhanced when we spend time with people with similar interests. Spending time in nature can help enhance spirituality in many ways. For one, just walking through a lush forest or sitting by a lake, is an intensely mindful pursuit; in the stillness and majesty of what we see, hear and feel in such a setting, it becomes easier to tune into our thoughts and feelings, accepting and honoring them without letting them master us. It is no wonder that ancient peoples such as the Aborigines of Australia and the American Indians saw nature and spirituality as intertwined; it seems almost impossible to truly know ourselves when we are indoors, hooked to technology, for hours a day. Research has shown that nature can positively affect our health. One study, for instance, showed that outdoor exercise and activities are more pleasurable than their indoor equivalents. Thus, gyms can be very useful when the weather is inclement, but on a warm, sunny day, nothing beats a session of outdoor yoga followed by a walk or even a picnic with friends. Research undertaken at the University of Exeter Medical School, which analyzed health data from 10,000 urban dwellers, found that people living near green areas report less mental distress; meanwhile a study by a team of Dutch scientists found lower rates of 15 conditions and diseases (including anxiety, depression, stress, diabetes, asthma, and heart disease) in people living close to green spaces. Nature is much more than a luxury for human beings; it is an essential need. If you feel like doing your share for the needy and inviting a bid of good karma into your life, then Yogafest or Full Moon Fridays may be right up your street. Take pleasure in knowing that in addition to doing good for others, you will also be benefiting yourself, since yoga by a serene lakeside or other natural setting will lower stress, keep disease at bay, and instil the mindful mindset you need to truly connect with your inner world. This article was contributed by freelance writer Sally Perkins.